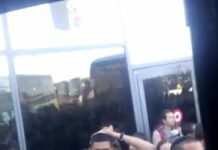 Nosy neighbors caught a video of a law enforcement officer in California snatching a bystander’s phone and smashing it after U.S. Marshals realized she was recording their bust of a biker gang meeting. 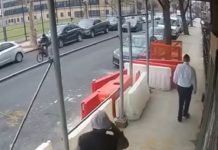 The 53-second video, taken from across the street, shows a gun-toting marshal grabbing the woman’s phone out of her hand, throwing it to the ground, and finally kicking it. About time the Guberment workers were held to the same standards as us “civilians”. Somehow doubt the storm trooper will face any criminal charges for his criminal actions.